A Japanese funeral includes a wake, the cremation of the deceased, a burial in a family grave, and a periodic memorial service. According to statistics, 99.82% of all deceased Japanese are cremated. While the ashes of many are buried in family graves, the scattering of ashes has become more common in recent years, including a burial at sea or in space. Japanese burials are considered to be the most expensive in the word. The average Japanese funeral cost is about 4 million yen. These high costs are largely due to the scarcity of funeral plots, as well as price gouging amongst Japanese funeral homes. While Japan has a mixture of Shinto and Buddhist beliefs, many Japanese funeral services are mostly carried out in the form of Buddhist ceremonies. After a person has died, their lips are moistened with water, in a ceremony referred to as Matsugo-no-mizu ("Water of the last moment"). The household shrine is closed and covered with a white paper, to keep out impure spirits. This process is known as Kamidana-fuji. A small table placed beside the deceased's bed is also decorated with flowers, incense, and a candle. A knife may also be used (placed on the chest of the deceased) to drive away evil spirits. Japanese funeral arrangements at a temple usually fall under the responsibility of the of the eldest son. 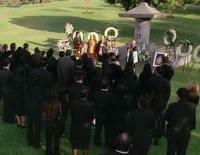 Some believe that certain days are better for a funeral than others. For example, the days known as tomobiki ("friend pulling"), is a day preferred for weddings, but is avoided for Japanese funerals. In preparation of the funeral, the body of the deceased is washed and the orifices are blocked with cotton or gauze. Japanese funeral clothing will consist of either a suit for a male or a kimono if the deceased is a female. In some instances, a kimono may be also be used for the male, although it is not that common. Makeup may also be applied in order to improve the appearance of the body. After being clothed, the body is put on dry ice and placed inside the casket with the head positioned towards the north or west, along with a white kimono, sandals and six coins for the crossing of the River of three hells. In addition, items which the deceased was fond of will also be placed inside so long as they are flammable (e.g., cigarettes, candy). The casket is then placed on the altar in preparation of the wake. Years ago, people attending a Japanese funeral would wear white clothing, but today that has changed. Today, guests attending a Japanese funeral will dress in black attire. Men usually wear black suits with a white shirt and a black tie, while women wear either a black dress or a black kimono. A Buddhist prayer bead called juzu may also be carried by guests. Guests would also bring condolence money in a special black and silver decorated envelope. Depending on the relation to the deceased and the wealth of the guest, this may be of a value equivalent to between 5,000 and 30,000 yen. The guests are seated, with the next of kin closest to the front. The Buddhist priest will read a sutra. The family members will each in turn offer incense three times to the incense urn in front of the deceased. The wake ends once the priest has completed the sutra. Each departing guest is given a gift valued between 1/4 and 1/2 the value of the condolence money they contributed. The closest relatives may stay and keep vigil with the deceased overnight in the same room. 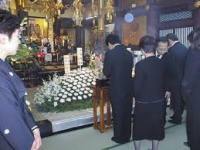 Japanese funerals are usually performed on the day following the wake. The funeral service is similar to that of the wake service, with incense being offered while a priest chants a sutra. The ceremony differs slightly in that during this service, the deceased receives a new Buddhist name (kaimyo). Receiving a new name supposedly prevents the return of the deceased if their name is called. The length and prestige of the name is dependent on the size of the donation given to the temple by the relatives, which can range from free to very inexpensive to a more elaborate name for 1 million yen or more. This method of receiving names is a source of controversy, especially since pressure is placed on families by temples to buy the more expensive names. At the end of the Japanese funeral ceremony, flowers may be placed inside the casket before it is sealed and carried to an elaborately decorated hearse where it is transported to the crematorium. In some regions of Japan, the coffin is nailed shut by the mourners using a stone. Once the casket has arrived at the crematorium, it is placed onto a tray. The family will witness the sliding of the body into the cremation chamber, then they will leave. According to the Yamaguchi Saijo Funeral Parlor and Crematorium in Sapporo, it takes about an hour and a half to cremate an adult body, 45 minutes for a child, 15 minutes for a stillborn baby. The gurney with the final remnants is allowed to cool for fifteen minutes before being presented to relatives for bone and ash collection. After the cremation process is complete, the family returns to pick the bones out of the ashes and transfer them to an urn using chopsticks. In some instances, two family members will hold the same bone at the same time with their chopsticks or pass the bones from chopsticks to chopsticks. According to Japanese custom, this is the only time when it is proper for two people to hold the same item at the same time with chopsticks. 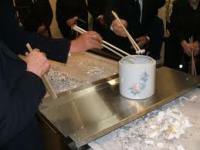 At any other time, two people holding any item with chopsticks at the same time, or passing the item from chopsticks to chopsticks is a reminder to all who are witnessing this, the funeral of a close relative which is considered to be a major social faux pas. The bones of the deceased's feet are picked up first, and the bones of the head last. It is done in this manner to ensure that the deceased is not placed upside down in the urn. The hyoid bone, (the neck bone), is the most significant bone that will be placed into the urn. In some cases, the ashes of the deceased will be divided between more than one urn for transporting to different locations (e.g., family grave, the temple, or scattering location). Many companies in Japan have graves reserved for employees in the graveyard on Mount Koya, so family members may have an urn transported to this location. Depending upon the local custom, the urn may stay at home of the deceased for a specific number of days before being transported, or be taken directly to the grave site. There are a number of cases where the ashes of deceased persons have been stolen from graves. The ashes of famous cartoonist Machiko Hasegawa and of the wife of real estate chairman Takichi Hayasaka were stolen for ransom. The ashes of famous novelist Yukio Mishima (1925 - 1970) were stolen in 1971 and the ashes of novelist Naoya Shiga were stolen in 1980. The ashes of the wife of the baseball player Sadaharu Oh went missing in December 2002. Many companies have graves reserved in the largest graveyard in Japan, Okuno-In on Mount Koya. These graves are for former company employees and their relatives, and often have a gravestone related to the company business. For example, the coffee company UCC has a gravestone in the shape of a coffee cup, and a metal rocket sits on top of the gravesite of an aeronautics company. The typical Japanese funeral grave is usually a family grave (Japanese: haka) consisting of a stone monument with a place for flowers, incense, and water in front of the monument and a chamber or crypt underneath for the ashes. The date of the erection of the grave and the name of the person who purchased it may be engraved on the side of the monument. The names of the deceased are often but not always engraved on the front of the monument. When a married person dies before his or her spouse, the name of the spouse may also be engraved on the stone, with the letters painted red. After the death and the burial of the spouse the red ink is removed from the stone. This is usually done for financial reasons, as it is cheaper to engrave two names at the same time than to engrave the second name when the second spouse dies. It can also be seen as a sign that they are waiting to follow their spouse into the grave. However, today, this practice being seen less fequently. The names of the deceased may also be engraved on the left side, or on a separate stone in front of the grave. Often, the name is also written on a sotoba, a separate wooden board on a stand behind or next to the grave. The sotoba may be erected shortly after death, and new ones may be added at certain memorial services. Some Japanese funeral graves may also have a box for business cards, where friends and relatives visiting the grave can drop their business card, informing the caretakers of the grave of the respects the visitors have paid to the deceased. The high prices of funeral plots, costing on average 2 million yen, have led to a new service of Grave Apartments (Ohaka no manshon), where a locker-sized grave can be purchased for about 400,000 yen. Some of these may include a touch screen showing a picture of the deceased, a family tree, messages, and other information. Due to the cost of land, a graveyard in Tokyo has recently been opened by a temple in floors 3 to 8 of a nine story building, where the lower floors are for Japanese funeral ceremonies. In Japanese history, famous leaders were often buried in tombs. The oldest known burial chamber was that built between 230 BC and 220 BC in Sakurai, Nara prefecture, called the Hokenoyama tomb. It is not known exactly who is buried there, but it is presumed to be a powerful local leader. Around 300, the usage of burial mounds for important leaders became more frequent. Japan developed its unique keyhole shaped burial mounds. These burial mounds are called Kofun and the period from 250 to 538 is called the Kofun period. Around 50 years ago, it was believed that these mounds had their initial influenced from the burial mounds in China via the Korean peninsula, Yayoi period mounds are generally regarded as their predecessors. In Japan, there are a large number of these burial mounds which have a keyhole shaped outline with a length of up to 400 m. The largest is the tomb of Emperor Nintoku in Sakai near Osaka, with a length of 486 m, covering an area of 300,000 square metres. They are usually surrounded by a moat, unless they are constructed on a hill. The round half of the burial mound contains a burial chamber. In the 6th century, round and square burial mounds came into use. The usage of burial mounds is believed to have gradually stopped either with the introduction of Buddhism in Japan in 552 or 538, or with the establishment of the capital in Nara by Empress Gemmei in 710. Thereafter, family tombs were constructed with an access passage to add relatives to the tomb after their death. After the Japanese funeral services is complete, there will be another service on the Obon festival in honor of the dead. The festival may be held in the 1st year, the 3rd and 5th years, the 7th and 13th years, and a number of times afterwards up until the 39th or 50th year. One popular sequence follows the days of the Thirteen Buddhas. A picture of the deceased is also placed at or near the family altar in the household and in the first year after death, their can be no sending or receiving of the traditional New Year's Day Postcard. Japanese funerals in the Buddhist style make up the vast majority of Japanese funerals today and were generally performed in what was historically the Soto Zen style. Today, Soto funeral rites define the standard funeral format used by many Japanese Buddhist schools. Japanese Zen funeral rites came directly from Chinese Ch'an funeral rites, which were detailed in the Ch'an-yuan ch'ing-kuei ("the pure regulations of the Zen monastery"). The major difference between the earlier Chinese Ch'an funerals and Japanese Soto Zen funerals was that Japanese monks made no distinction between monastic funerals for an abbot or a layperson. The first Japanese laypeople to receive Zen funerals were among the ruling elite who sponsored the activities of Zen institutions. One early example of this is the Regent Hojo Tokimune, who received monastic funeral rites in 1284 at the hands of Chinese monk Wuxue Zuyan. Zen historian Martin Collcutt asserts that "one means by which Zen monks extended their influence in society was by the conduct of funeral services for important patrons." By the medieval Soto period, only a small percentage of the funeral sermons recorded were delivered for members of the monastic order. The progressive changes in Soto Zen funeral rites were not enacted by its founder, Dogen, but came about years later when Zen master Keizan encouraged Zen monks to go out into the countryside and perform funeral services for the laity. At this point in Japanese history, different schools of Zen were in competition for followers, and they were "much more conscientious of the need to make such rites as funeral services and ancestor worship available to the laity." Keizan's inclusive attitudes toward funerals resulted in the building of many temples in rural areas and the gradual expansion of the Soto order throughout Japan. The Japanese funeral service that became popular for the laity in the medieval period was essentially the Chinese Ch'an service specified for the ordinary monk. The most important phases of this type of Zen funeral were: posthumous ordination, the sermon at the side of the corpse, the circumambulation of the coffin around the cremation ground, and the lighting of the funeral pyre. For a lay person, the posthumous ordination part of the ritual was the most vital as it ordained the deceased as a Zen monk. If a person was not ordained, the other rites could not be performed since Zen funeral rites did not previously exist for laypeople, only monks. Once posthumous ordination of the laity was accepted by the Soto school, lay funeral practices became possible. Today, death rituals mark the central practice at Soto Zen parish temples, and one of the first few elements of Soto Zen standardized by the early Tokugawa period. Since the popularization of Soto Zen in medieval Japan, Soto Zen funeral practices have been a significant point of contact between the monks and laity, and continue to play an important role in lay religious life today.